First cut a 6" x 9 1/2" piece of Stampin' Up! Elegant Eggplant card stock and fold it in half for the base, a 4 1/2" x 5 3/4" piece of Stampin' Up! Wisteria Wonder for the middle layer and a 4 1/4" x 5 1/2" piece of white for the front layer. Next heat emboss the image using Versamark ink and white embossing powder. Allow to cool then sponge Wisteria Wonder ink around the entire image. Then use a paper towel or rag to buff ink off the embossed images. Next use a Stamp a ma jig to stamp the sentiment with a stamp from the Stampin' Up! 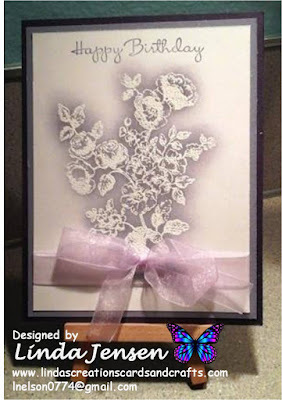 Happiest Birthday Wishes set in Wisteria Wonder ink, tie the ribbon around the bottom, attach the embossed card stock to the Wisteria Wonder card stock, then to the Elegant Eggplant base and enjoy!